Last week I’d never heard of Martyn Hett. It turns out we lived in the same area of Stockport but our paths had never crossed. Now I know lots about him. His favourite drink was a vodka and Diet Coke; he loved Coronation Street; he was planning a trip of a lifetime round America – and he was murdered by a suicide bomber at a pop concert in Manchester. Martyn, 29, was one of 22 people killed by Salman Abedi who detonated a bomb in his backpack as singer Ariana Grande finished her set at the Manchester Arena last Monday night. On Sunday his family and friends went to say a final goodbye to him in Trafford Hospital, and then staged a two-hour vigil to remember a young man who was variously a much loved son, an adored big brother and a soulmate. 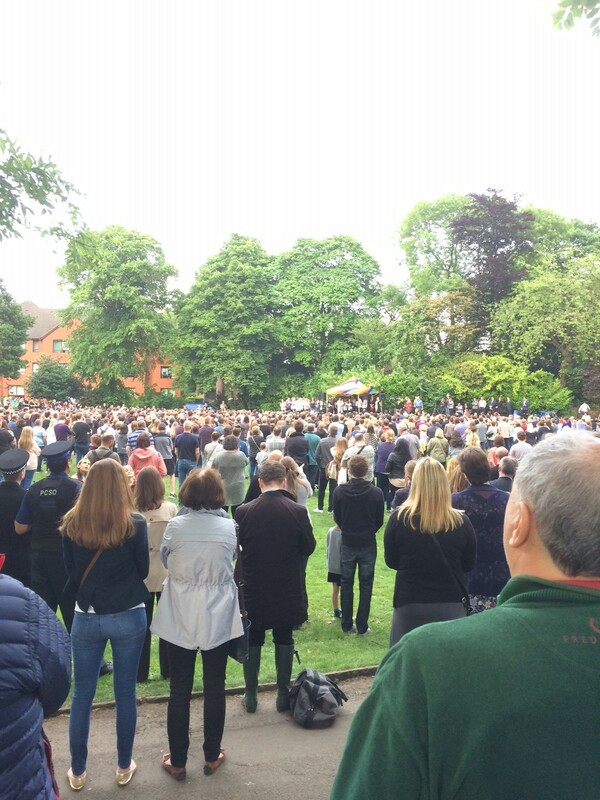 The vigil was held in Heaton Moor Park, about a 10 minute walk from my house. Normally I take my three-year-old daughter there to jump in puddles and race down the slide, while her baby sister giggles in delight. Instead, almost a week after the attack - on Sunday night - I went there, along with hundreds of others, to light candles, listen to the tributes and pay our respects to a man ripped from the heart of our community by an atrocity which has shocked the world. But this wasn’t a sombre vigil with mourners dressed in black, that was apparent from the huge rainbow pride flag tied to the park gate at the entrance. Inside there were couples, groups of friends, families and pensioners, gathered round a stage which was draped with colourful striped cotton and fairy lights. Next to me a toddler giggled as he rolled down a grassy bank, then grinned at hismum as he found a leaf to chew on. On the stage another mother, Martyn’s, told of her ‘mischievous imp’ of a son – no doubt once a cheeky little boy too – and how she would refuse to give in to hate. Figen Murray stood strong, surrounded by her family, as she told the crowd: “It’s due to all this love and kindness that I’m never going down the route of hate or anger at those responsible for what happened. “Badness is a permanent feature in the world at the moment, but I have learnt this week that it also has an abundance of goodness and that by fair outweighs the darkness. When Martyn’s dad Paul took to the stage his voice faltered, but didn’t break. On stage his family held his hand and on the grassy field the crowd willed him on. He announced he plans to honour his son’s vivacity, spontaneity and joy by getting a tattoo reading #bemoremartyn; ‘the last thing he would ever have expected his dad to do’ he said. Martyn’s partner Russell Hayward told of his ‘soulmate’, a man he fell in love with instantly and who could ‘turn a 10 minute trip to the charity shop into the most fun 10 minutes of my life’. He continued: “The pain I felt when I found out the news this week completely tore my heart out, but I will not let that pain tear away any of our precious memories we’ve shared. Next to me a daughter squeezed her mum’s hand, and a collective intake of breath conveyed an instant solidarity with the man on the stage, whose loss is really too big to contemplate. 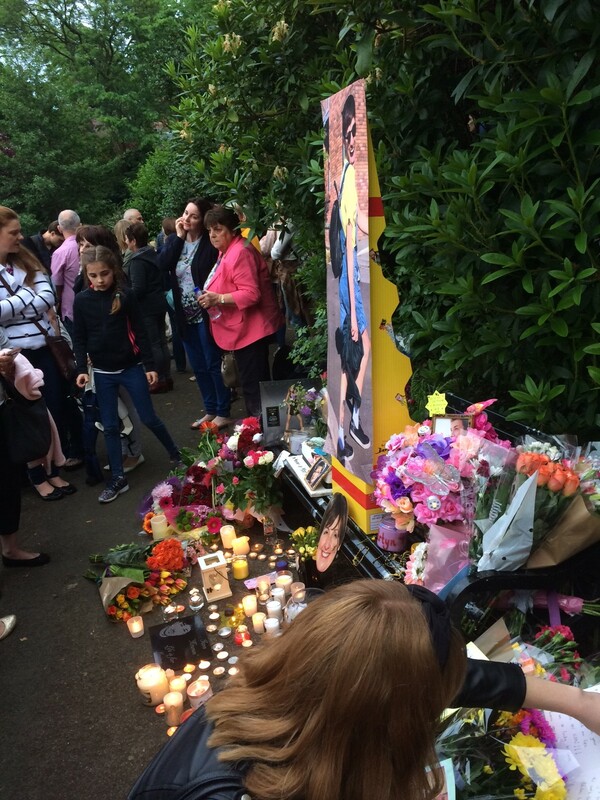 Martyn’s stepmum and stepdad added their tributes, his three siblings, his friends and even Coronation Street actress Shobna Gulati, who read a poem composed by one of the soap’s writers. The sun gradually set, the birds sang, and to my right six friends sat on the hill each holding a wooden letter illuminated with fairy lights to spell out the word ‘ICONIC’. Behind them a queue formed as people politely waited to decorate a shrine to Martyn with pictures, candles and flowers. Another toddler munched a bag of Quavers while his mum placed a lantern in front of Martyn’s picture, while on the stage a community choir sang ‘Man in the Mirror’ by Michael Jackson. Like I said, I never met Martyn Hett. And I never will. But he will never be forgotten.